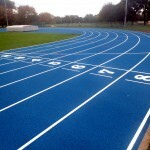 The most popular athletics track design installed in the UK is the porous textured athletics track specification. This is widely used in running track stadiums, colleges, schools, sports universities and athletics clubs. We are able to install this type of surfacing to create top quality facilities for both recreational and competitive use. Feel free to contact our team today to get more information and advice on this type of athletic surface. Just let us know what you need and we’d be happy to explain our services in more detail and send you over a quote for any work which might be required. Simply fill in the contact box on this page to speak with an expert as soon as possible. The sprayed rubber flooring is also known within the market place as porous structural spray running track surfacing. This consists of an SBR rubber granule base course material and this is mixed on site with a polyurethane resin binder and installed to a prepared sub base. This base mat is then sprayed with an EPDM rubber material which is also mixed onsite. This is combined with a PU resin binder but then sprayed to give the textured finish for this surfacing specification. 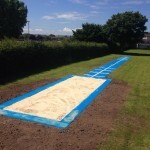 The Porous Structural Spray Running Track wearing course in EPDM can come in a selection of colours with the most common being red, blue or green. The majority of the UK athletics tracks are installed in the red colour also known as the tartan track. You can customise the look of your facility with a specific colour scheme or size to make sure it’s perfect for your school or club. 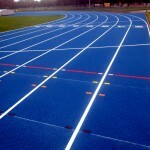 The reason the structural spray specification is so popular is because the textured running track costs are less than the sandwich system or PU Track specifications and whilst not as hardwearing the re-application of this Porous Structural Spray Running Track will economically prolong the lifespan of the existing athletics surfacing. These porous textured athletics track specifications can be laid and installed in conjunction with IAAF track accreditation and UK athletics governing body certification but you need to make sure you check this because many contractors and suppliers have different binders they use from manufacturers like Polytech, Polytan, Stockmeier or Rosehill. If you would like more information on the porous textured athletics track then please fill in the contact form and we will get back to you with a quote. The work you require might be a new construction or resurfacing of an existing athletic track and field facility, but we can offer advice on all of these. We will need information like the location of the running track, sizes and dimensions of the facility and any photos you might have of the current conditions. This will help us to give you the most affordable quote which takes all factors into account.